The hibiscus tree - with tropical flowers the size of a salad plate or smaller ones decorating the tips of weeping branches - is one of the most in-demand accents for South Florida landscapes. Hibiscus is probably our most commonly planted flowering shrub, and the tree forms of this plant are beautiful and eye-catching. Weeping hibiscus trees and shrub hibiscus standards (shrubs trained to a single tree-like trunk) are extremely versatile plants. They can add needed height to a garden bed, draw attention as a focal point, or act as a single specimen tree in a small space. Hibiscus is available in an amazing array of colors - from the typical red, pink, white or yellow to exotic and multicolored. There are literally thousands of beautiful colors and combinations, with single or double blooms. 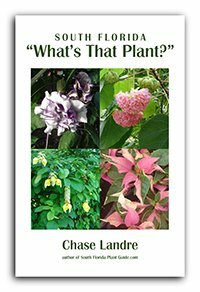 Leaves can have color too, like variegated Snow Queen and the pink/red foliage of Lava Red - both bloom with red flowers, a striking contrast to their leaf color. The classic weeping hibiscus is the Anderson Crepe, a pink-flowering fantasy with an exaggerated weep. Weepers are generally left to grow bigger than shrub standards - and they're low maintenance, requiring little trimming. 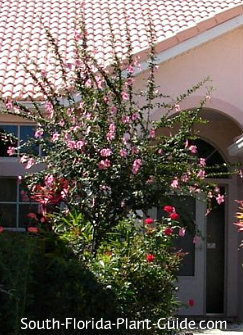 Don't overdo the strong landscape impact of a hibiscus in tree form. They're better used alone or sparingly to act as focal points rather than overwhelming the landscape design by using too many. Place the tree so blossoms can fall without being in the way. Flowers can be messy and will stain pavers or concrete...and they're banana-peel slippery when wet on the ground. 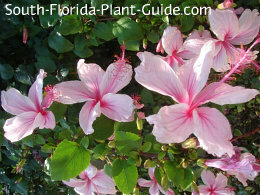 Evergreen and moderately salt-tolerant, hibiscus likes to be watered regularly with time to dry out a bit in between. It does well anywhere in Zone 10 and warmer areas of Zone 9B (with cold protection) in full to part sun. 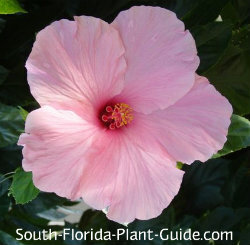 These are fast growers - regular hibiscus trees can be kept about 6 to 8 feet, and weepers should be left to grow taller - about 10 to 12 feet or more. Add top soil or organic peat humus to the hole when you plant - preferably in combination with composted cow manure. The shrub hibiscus standard will need shaping occasionally, with a hard prune in spring -late March to early April. Trim a weeping hibiscus sparingly - the long branches contribute to the "weep factor." In spring, trim branch ends back to encourage new growth. Fertilize 3 times a year (spring, summer and autumn) with top quality fertilizer high in phosphorus (supplement with bone meal and/or liquid) to promote heavy bloom. 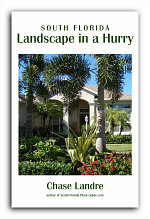 Plant at least 3 feet or more from the house (4 to 6 feet for weeping trees). Situate where the flowers won't make a mess. Hibiscus trees are fine in large containers, especially while young, though like all plants they prefer being in the ground. Just be sure to place potted ones where fallen flowers won't make a mess...avoid pool and patio areas. 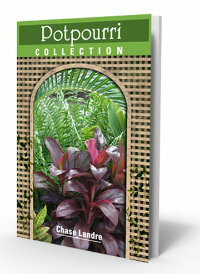 COMPANION PLANT SUGGESTIONS: Snowbush, plumbago, ixora, fountain grass, dwarf allamanda, purple queen and foxtail fern.